Japanese Prime Minister Shinzo Abe speaks during a joint news conference with Chinese Premier Li Keqiang in Tokyo (May 9, 2018). 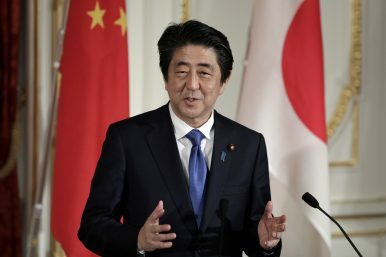 Japanese Prime Minister Shinzo Abe is to arrive in Beijing on October 25 for his three-day official visit to China — the first formal trip by a Japanese leader in seven years, aside for brief visits tied to multilateral events like the 2016 G20 meeting. Abe is scheduled to have a summit with Chinese President Xi Jinping and attend a reception commemorating the 40th anniversary of the signing of the China-Japan Treaty of Peace and Friendship. He will also attend the First China-Japan Third-Market Cooperation Forum, according to China’s foreign ministry spokesman Lu Kang. Abe’s official visit comes at a critical time in U.S.-China relations, where tensions are no longer limited to the ongoing trade war. In particular, U.S. Vice President Mike Pence’s hardline speech against China delivered on October 4 indicated that tensions between Beijing and Washington have risen in all realms. The deteriorating U.S.-China relationship together with China’s staggering economy has triggered a wave of criticism against China’s top authorities at home and abroad, despite Beijing’s fierce censorship. Under the circumstances, the Chinese government can no longer afford to maintain a sour relationship with Japan — the world’s third-largest economy as well as a major power in Asia. Understanding this well, Abe appears ready to grasp the opportunity to achieve a fruitful result through this visit to China. According to The Mainichi, during his upcoming trip, Abe will end Japan’s almost 40 years of providing official development assistance (ODA) to China. Since 1979, when Japan began providing ODA to China, Tokyo has contributed some 3.65 trillion yen (about $32.52 billion) — mostly in the form of low-interest loans — to China. But with China now ramping up its own ODA efforts to other countries, it’s hard to justify having Beijing also receive aid. Instead, Japan is seeking to cooperate with China on initiatives in third countries. An individual close to the Japanese Ministry of Foreign Affairs told The Mainichi that the end of ODA will usher in “a new phase in the relationship” between both countries. “Now we want to cooperate with China to support other [foreign] regions,” the source added. The cooperation the source talked about seems to refer to Xi’s signature Belt and Road Initiative (BRI). Japan has repeatedly expressed its willingness to join Beijing’s BRI despite U.S. concerns over it. If Abe does officially announce Japan will cooperate with China on BRI during his visit, it will to a large extent help Xi to justify the BRI in the international community. Additionally, The Associated Press reported that around 500 Japanese business leaders will accompany Abe — an implication that a raft of trade deals will be signed between the two sides this time. A Japanese government source told Voice of America that there will be announcements during the visit by private companies, although it is “not going to be a big deal like when Mr. Trump came to Beijing.” China and the United States announced $250 billion in trade deals when U.S. President Donald Trump visited China last November, so even a much smaller deal between China and Japan could still amount to billions of dollars. From Beijing’s point of view, business agreements with Japan will also benefit China’s slowing-down economy amid the trade war with the United States.